While Colonel Nils von Schoultz unloaded raiders and munitions from the Charlotte of Toronto at the windmill mid-morning, November 12, 1838, the other Hunter schooner remained stuck in the mud. It held the bulk of their supplies, including several large cannon. General John Birge, in his only meaningful involvement of the battle, attempted to free the grounded ship. Birge marched at the head of over 100 armed Hunters and hijacked the United States for the second time in as many days. With the steamer’s crew running the ship, the 450-ton side-wheeler set out. In the wheelhouse with Birge were Oliver Pierce and Soloman Foster. Pierce was a Hunter officer with no military experience, a lecturer in grammar and phrenology (a quack science taken seriously in that era). Foster was the teenage helmsman, a ship employee, not a Hunter. The mud shoal prevented the United States from getting close to the stranded schooner and no rope on board was long enough. Birge ordered the ship back to Ogdensburg for a longer rope. Across the river in Prescott, Royal Navy Lieutenant William Newton Fowell, 35, watched Birge’s first attempt. Fowell commanded the Experiment, a 150-ton, civilian steamer armed with an 18-pound carronade (a short naval cannon) and a 3-pound swivel cannon. When the United States attempted to the rescue the schooner a second time, it crossed into Canadian waters. Fowell pounced. At full speed, the little steamer bore down on the bigger ship and fired a round from both guns, while the Hunters on board the United States peppered Fowell’s ship with rifle fire. The Experiment let loose another round as it passed by. Accounts of the accuracy of Fowell’s gunners vary. Some sources, mostly Canadian, say all rounds hit the big ship but did no serious damage. Other sources, mostly American, say the shots missed. Whatever the truth, that first encounter left the United States unscathed. Seconds after the boom of Fowell’s first broadside swept the river, Birge had a sudden attack of “seasickness” and retired to a stateroom, leaving Pierce in command. Pierce ordered the steamer downriver to protect the Charlotte of Toronto as it disembarked the first wave of Hunter raiders, about 70, and limited provisions. Both Hunter ships returned to Ogdensburg. The Experiment returned briefly to a station near Prescott. 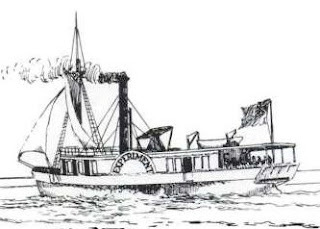 In the interval, other Hunters commandeered the Paul Pry, a 50-ton, shallow-draft, steam ferry, and successfully towed the Charlotte of Oswego off the mud. The Experiment intervened and hurled multiple rounds of cannon balls and grape shot at both the little steamer and the schooner. To Fowell’s surprise, the schooner fired back. A Hunter recruit named Isaac Tiffany fired a field cannon stored on deck. Again, accounts vary. Some sources, mostly Canadian, say the shot missed. Other sources, mostly American, say the shot swept through the Experiment killing and wounding many crew. Whatever the truth, the Experiment backed off. Both Hunter ships returned to Ogdensburg safely, though the schooner’s sails had been shredded by the grape shot. In early afternoon, Pierce ordered the United States back to the Canadian side to ferry Hunters who wanted to join the fight. Hunter Admiral Bill Johnston greeted the returning steamer and helped unload 110 men using his own boat. One of the men Johnston welcomed ashore was Lyman Leach, his comrade at the Hickory Island occupation and the plot against the Sir Robert Peel. As Pierce captained the big steamer back to Ogdensburg, Fowell came out to challenge him again. Pierce ordered Foster to set a course to ram the Experiment to end its meddling. Foster, clearly having the most exciting day of his life, did as asked. The ships steamed towards each other at a combined speed of 18 knots. A collision would clearly sink one or both of steamers. All of Pierce’s bravery was no match for Fowell’s experience. On his orders, the Experiment swerved and fired its cannon at close range. The larger cannonball damaged the starboard paddlewheel on the United States. The small ball passed through its pilothouse, removing most of young Foster’s head. The big steamer limped back to Ogdensburg in late afternoon. The remaining Hunters, including the still ill Birge, disappeared into the crowds. Troops under US Colonel William Jenkins Worth, 44, arrived and confiscated the two schooners and the Paul Pry, effectively cutting off the Hunter’s supply route to the windmill. Most of the troops, artillery, and supplies von Schoultz needed were on the wrong side of the river. Throughout the night rowboats made the one-mile trip between the two shores, carrying men in both directions—fighters going north and deserters going south. Some men came just to gawk or talk. One of these was General William Estes, Birge’s second in command. He chatted with von Schoultz, assuring him that more men would arrive, and then departed. Witnesses recalled Johnston stomping about the Ogdensburg port that night urging Hunters to cross to their comrades. Few did. Johnston rowed across at least twice with small groups of men. One recruit was Orin Smith, 26, one of the two men who fired a cannon at the Experiment that day. Johnston’s last visit to von Schoultz was about midnight. He said 500 Hunters still occupied Ogdensburg and he promised to do his best to get them over. But Admiral Johnston had no means to keep that promise. Worth had impounded the Hunter fleet. The owner’s of the United States had partly dismantled an engine to prevent further hijacks. In addition, an American steamer, the Telegraph, now patrolled in mid-river to prevent any further crossings. Von Schoultz and his army were on their own and cut off from supplies and reinforcements.